Thanks to globally respected and acclaimed brands like BMW and Mercedes Benz, Germany has a reputation as the home of well-engineered and optimally-designed products. This reputation appears well deserved when it comes to the ELO Top Collection 18/10. Indeed, ever since 1934 ELO made a name for itself as a reliable source of precision-machined high quality cookware in Germany. Fast forward to today and ELO has become a globally recognized cookware brand. Its attention to detail and manufacturing precision throughout the years have definitely not gone unnoticed. The great thing about the ELO Top Collection is that is makes for a great entry purchase to the wide range of cookware benefits and overall manufacturing excellence this well-respected German brand brings to your table. You get a 9-piece set that fully demonstrate the heating superiority of induction cooking technology. The most exciting part to this ELO package is it is able to give you a solid experience with induction cooking without burning a hole in your wallet. This package delivers a versatility, long term value, and high quality at a very decent package price. In assessing this ELO cookware set, we focused on its special features, long-term value potential, versatility of use, ease of use, cleaning difficulty level, and ability to last. Ever since it began, German company ELO was known as an innovator. Well, one look at the interior of this 9 piece cookware set definitely reminds us of how distinctive ELO can be when adding a few labor-saving tweaks to its product line. All the items in this package have a proportion system built into their design so heat is evenly distributed through out the cookware’s cooking surface. At the sides of each piece, you will see a measuring scale so you would not have to guess how much content you’ve put inside the cookware. As for the cookware pieces themselves, they are made of stainless steel which give off a nice industrial look both within and outside of the pieces. The steel finish gives one the impression that this cookware set means business and stands up to industrial use. Comprised of 4 pots and 1 pan, the set also ships with matching shock-resistant glass lids. 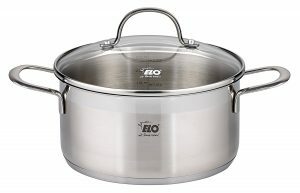 Considering how long ELO has been known, respected, and prized in the cookware industry, the fact that this piece ships with the ELO brand pretty much settles any value debate. You only need to look at the set pieces’ precision machined look, interior and exterior design, incorporated measurement, incorporated distribution technology, and great lids to get a solid appreciation of the high quality German engineering and attention to detail ELO brings to any product that bears its brand. Given the versatility of these pieces (they operate equally well on glass, induction, electric, and gas cooktops) and their solid construction, you stand to enjoy long term value with this ELO product. 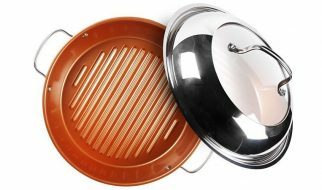 In terms of versatility, this package’s 4 pot and 1 sauce pan pieces ensure that you’ll be able to cook whatever you need to cook because you have the appropriate specialized took you require to do a great job. Whether you need a small pan or a heavy stock pan or something in between, you can handle whatever cooking job you assign yourself. You can cook with confidence because you not only have the pieces you need to heat ingredients in different ways and in different volumes, you can take quite a lot of comfort knowing that these pieces’ engineering and design ensures your ingredients will be cooked efficiently. In addition to cookware specialization and size variation, you also benefit from the versatility of this cookware collection based on heat sources. Whether you are going to be placing them on top of glass cooking tops, induction cooktops, or traditional gas or electric ranges, these pieces will generate or conduct heat to where it needs to go. You don’t need to worry about proper heat conduction thanks to this set’s multiple heat source design. From glass cooktops to induction cooktops to open flames, you can cook with maximum confidence and comfort because these pieces are very light and easy to move around. Take the case of the sauce pan in this set. If you’re sauteing and need to flip the ingredients, you only need to flick your wrist to turn the ingredients. The pan is that light and easy to work with. It doesn’t feel unbalanced due to uneven weight distribution. Thanks to each piece’s heat reducing ergonomically designed handles made of stainless steel, you can quickly and easily move each piece among different heating pads on whatever cooktop you’re using. 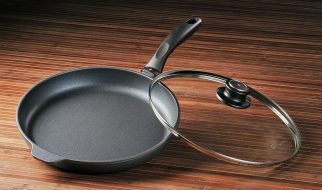 The ergonomic placement of the handles also ensure a firm and even grip regardless of how much ingredients are in the cookware you’re moving around. Although this cookware set isn’t decked out with non-stick surfaces, cleaning them is still a breeze. You only need to put them in your dishwasher to clean them up. No need to soak. Each piece is quite light so putting them in the dishwasher doesn’t take much effort at all. Keep in mind that this package’s lids are shock resistant so even if you were to slip when holding them during cleaning, you have some measure of confidence that your lids won’t instantly shatter. ELO backs this cookware package with a 4 year unlimited warranty. Keep in mind the nature of the warranty. Many other induction cookware sets just back up their nonstick surface or their body. ELO backs each and every piece of cookware in this set so if you’re unhappy, you get your money back. That’s how confident ELO is in its ability to deliver solid value to its customers. If you’re looking for a great set of induction cookware backed up by one of the most credible and reputable brands in global cookware technology, you can’t go wrong with this set.